Many people often dream of owning a pool or even a hot tub, but what if you could own a swim spa? Many people have never even heard of a swim spa, but it could very well be the perfect addition to your home. Smaller than a swimming pool, but larger than a typical hot tub, a swim spa is just the right size for many water enthusiasts. 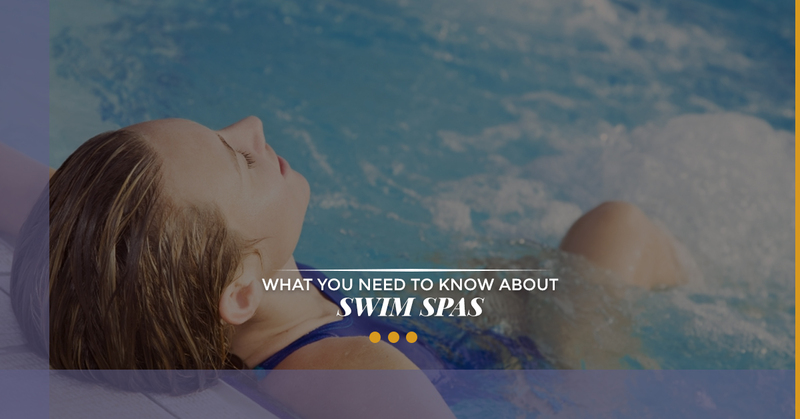 Today, we would like to discuss swim spas in more detail. A swim spa is much smaller in size than a regular swimming pool, so you may be wondering how people can even swim in it. The entire time that you paddle in a swim spa, you are moving against the water current. This is why you are able to get such a great workout in such a small space, and you won’t worry about hitting a wall while you exercise. Installing swim spas is a breeze because they consist of one single, molded unit. Professional pool installment companies will be able to install both above-ground swim spas and below-ground swim spas much quicker than they would with a pool. Because swim spas take less time to install, you will spend less money on the service as well. If you have a small backyard, you may not be able to add a full-sized pool to your place. However, a swim spa might easily fit in your yard. Would you rather swim indoors? A swim spa might fit perfectly inside of your home as well. Generally, these spas are about 12 to 16 feet long, which could fit perfectly in a variety of different areas inside and outside of your home. Although exercise is good for you, certain types of exercise can aggravate conditions such as arthritis, joint pain, and injuries. There’s no impact involved with swimming, which makes it the perfect exercise for anyone recovering from an injury or suffering from arthritis. Although swimming in the water can be an incredibly relaxing activity, it’s quite a nightmare when you are surrounded by screaming hyperactive children running around and peeing in the pool. Also, there’s nothing more awkward when you are wading in the pool and a weird single dad starts hitting on you as his kids are watching. No bueno. Think about it; if a swim spa is smaller than a pool, that means there’s less maintenance. Spas involve less cleaning and less chemicals, which is a definite plus. This means you have more time to enjoy swimming or simply relaxing in your spa. If you don’t feel like swimming in your spa, just use it as a hot tub instead. Our indoor or outdoor spas are great for spending time with your favorite people and enjoying a good glass of wine. The versatility of swim spas is one of the biggest benefits of owning them, so have your cake and eat it, too. If you are interested in purchasing a swim spa, drop by our spa store in Maple Shade today. Our friendly, knowledgeable professionals are happy to answer any questions that you may have. We even service and repair our spas, so contact Spa Hearth & Home today.